Please call us on 020 8777 1866! Our showroom is the perfect place to start if you are thinking about a new wardrobe or some bespoke furniture. You will be able to browse our collections and product ranges – we have lots of different wardrobes and furniture pieces to show you, so you can understand the fundamental differences and decide on the aesthetic that is right for you. If you have already had your initial design visit with us, why not come along to our showroom? You will have a better understanding of prices and the space that is available, so seeing our ranges for yourself is a great way to get a real feel for them. If you would prefer to book a design appointment before visiting, just let us know a time that is good for you. Someone will be one hand to help when you visit our showroom. We will be happy to show you around, talk you through our furniture options and answer any of your questions. 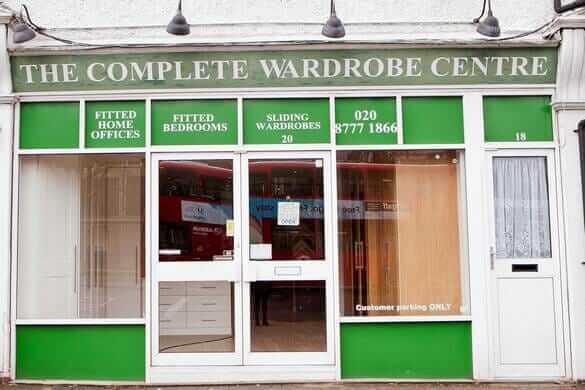 We are located within easy walking distance of central West Wickham. Public transport: We are just 0.1 miles from West Wickham train station, which is served by Southeastern trains. The showroom is served by the 194 bus route. Based in West Wickham, our highly skilled team design and install high quality, bespoke built-in furniture across Kent, Surrey and South East London. © 2019 Copyright The Complete Wardrobe Center. All rights reserved. | Website made by Make Me Local.